Today I caught myself doing the math on how much more winter we have left...talk about depressing! After just a couple months of cold weather, I find myself missing the foliage and the flowers that accompany warmer weather. While there is not much we can do about the flowers, there are many things we can do as landscapers and gardeners to increase the character of our own yards during these cold winter months. During the planning stages of any project I talk about "plants for all seasons". Often the first thing that comes to mind are evergreen shrubs and trees. These are a great way to create interest and color in the winter, but there is so much more opportunity out there. 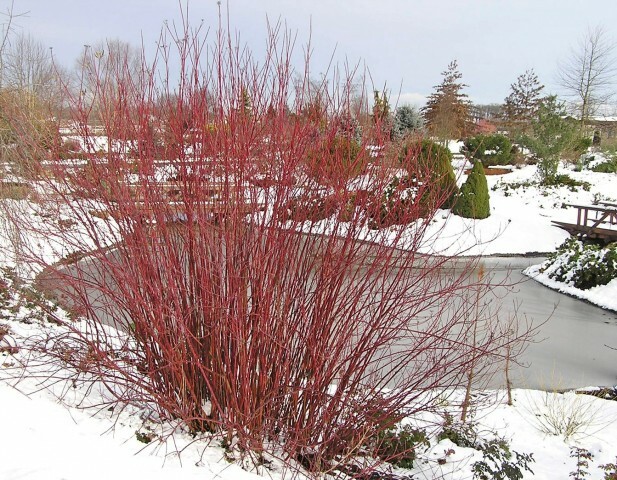 For example; the red twigged dogwood (pictured below) may be deciduous, but its bright red stems stand out during winter, creating beautiful contrast against the snow. 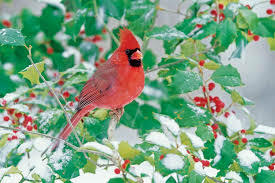 And let's not forget about the birds! Ornamental plants like fruit-bearing crabapple trees, as well as water features likes ponds & fountains, attract birds and other wildlife for your entertainment all winter long. We consider these and many other factors when designing a landscape for our clients' homes. Winter is our longest season, and one that should be a dynamic part of your landscape's appeal! So take a look outside...do you like what you see? If your answer is not a bold "YES! ", then be sure to contact us today to start planning your next project! Follow us on Facebook, Pinterest, and Houzz to see some of our latest projects and get inspiration for your landscape.